Many men experience different voiding symptoms. These include obstructive type symptoms such as a slow flow, difficulty initiating the flow despite having a strong urge to void, and dribbling at the end of voiding as well as symptoms related to bladder instability or irritability. These include voiding frequently and urgently and sometimes not being able to control the flow, such as when you put the key in the front door. These symptoms can be associated with a wide range of conditions but one problem that is very commonly present is an enlarged prostate or BPH (benign prostatic hypertrophy). Other conditions can mimic the symptoms associated with prostatic enlargement including infection, inflammation and even cancers. You will usually need to undergo several investigations that help determine the underlying cause of your symptoms that will then allow appropriate treatment to be instituted. As men get older their prostates tend to slowly increase in size and in the older age group prostatic enlargement is a major cause for voiding symptoms. 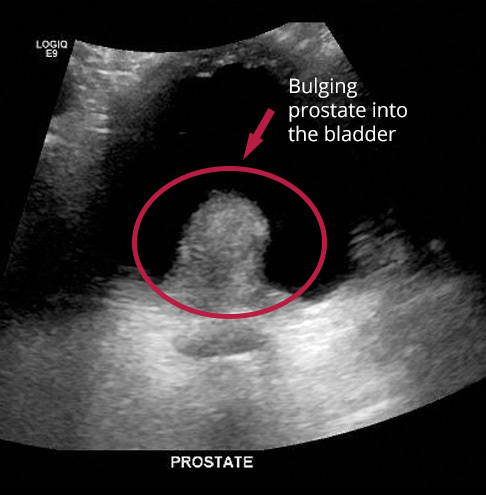 Many younger men have similar symptoms and even though their prostates may not be enlarged they may still have a blockage to the flow of urine (bladder outlet obstruction) due to a narrowing of the opening of the bladder (bladder neck) without significant prostatic enlargement. Another cause for the blockage to the flow of urine is scarring or strictures in the urethra for which there may have been no obvious cause that the patient is aware of. Each of these conditions can be relatively easily identified after routine investigations that will be discussed with you. Complications of a blockage to the flow of urine include infection, bleeding, bladder stones and even kidney damage. The blockage will need to be treated if these complications occur.